Bob: Two years have passed since the last episode of Summer Wine, so do we assume Roy Clarke spent 1980 and 1981 working on the revived Open All Hours? Whatever the answer, congratulations are due, Mr Smith – we’ve made it into the 1980s! 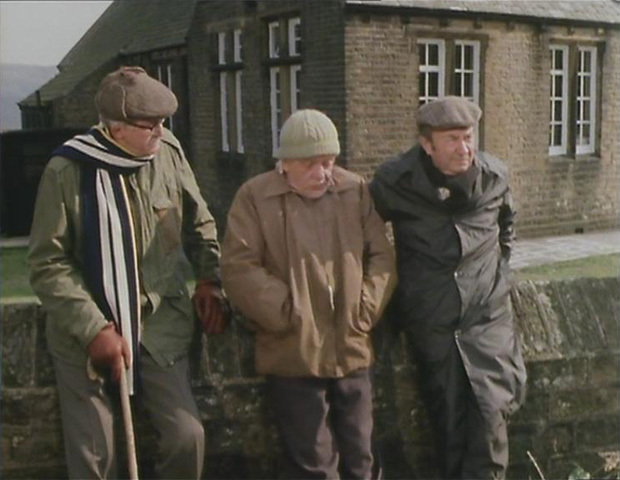 Will this be a brave new era for Last of the Summer Wine? Britain as a society changed immeasurably between 1973 and 1981, and it’ll be fascinating to see if Clarke’s writing reflects this at all. Andrew: It’s a shame Blamire isn’t on the scene any more. I’d love to have heard him and Compo discussing the merits of Mrs Thatcher. Bob: Oh blimey, yes! 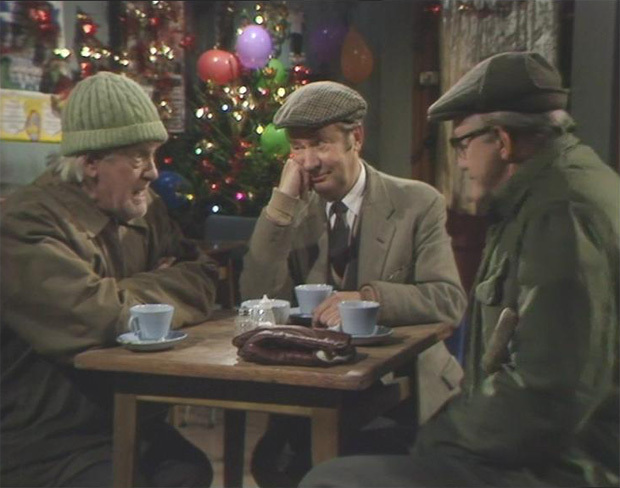 Anyway, this is a bit of a landmark episode… this first episode of Last of the Summer Wine actually to be broadcast on Christmas Day itself. And I have to say, the opening scenes here very place us firmly in the early 1980s… unusually, this is a Christmas episode actually set during Christmas, and the shop windows in Holmfirth are stuffed full of video games! They were certainly ahead of my family in that respect… my main Christmas present in 1981 was a table football game. A proper one, with handles and legs, not some kind of bleepy computerized gizmo! But it’s nicely evocative seeing the ‘Video Computer Systems’ piled up here in tiny shop windows festooned with fairy lights. 1981 was a fabulous time to be a kid… you had the excitement of the earliest home computers and video consoles, but still healthily combined with more traditional childhood pastimes. So we’d play on Paul Frank’s Atari 2600 for an hour, then spend an equal amount of time climbing a tree or building a bridge across the local beck. The best of both worlds. Andrew: And by ‘eck, Sid has gone all out with the tinsel! Forget your silver treat, wicker ornaments and glass beads, this is what a proper Christmas looks like. I love this scene. It’s like a checklist of all the ingredients I enjoy; insights into Sid and Ivy’s Christmas gift exchanges, unwanted Al Jolson impersonations and even Clegg’s-plain covered book, explaining the secrets of marital harmony. Bob: And hey, our first glimpse of our heroes’ old school! A location that goes on to feature regularly in Summer Wine, and – as we all know – it’s located in… erm… actually Drew, where is it again? Andrew: That would be Holme Jr. and Infant School, about a six-minute drive away from Holmfirth. I find this incredibly touching… possibly because, in December 1981, I was the same age as the kids in that school playground, and can almost reach out and touch that feeling… that nervous excitement of being in school in the last week of term before Christmas. 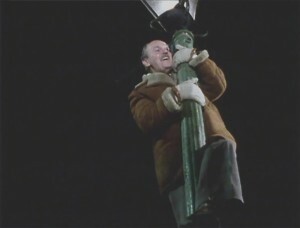 The carols in assembly, the nativity play, the Christmas postbox in the dinner hall – it’s all still there in my head. Right there. But also because I’m fully aware that I’m now much closer to Compo’s age than I am to my eight-year-old self, and I completely share his sentiment, too. I have let it slide. I can’t recapture those feelings no matter how hard I try. And that’s a sad feeling to come to terms with. But this is Summer Wine restating its ethos, isn’t it? Ageing miscreants facing up to their mortality by obsessing over their childhood and desperately attempting to recreate those halcyon days. It’s a principle that’s been at the heart of the show since the very first episode. Andrew: And, after watching a series that has increasingly been leaning towards slapstick, it’s a very welcome restatement. Even I’m getting twinges of nostalgia watching this and, as I’m always keen to remind you, I am considerably younger than your good self. Bob: A little bit too keen for my liking. And so our heroes embark on a quest that I’ve mulled over many a time myself… getting the ‘old school gang’ back together. Primarily Douglas ‘Chuffer’ Enright and Gordon ‘Splotter’ Lippinscale, long since lost into matrimony. Is this a good time to plug the Names Database again, Drew? Andrew: Certainly – and don’t forget the earlier mentions of Compo’s Uncle Dudley, who adopted a mule after it followed him home one night, and his Auntie Annie, who knew how to celebrate Christmas and only bit strangers! 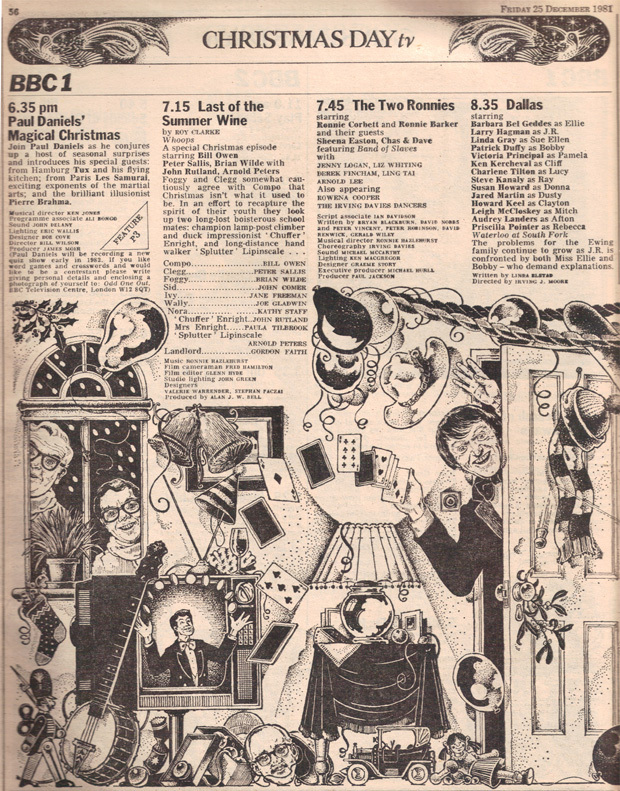 Bob: Despite Foggy’s resigned warning (‘You can’t recapture times gone past,’ he sighs, although that’s never stopped him retreating into indulgent nostalgia before), our trio enter darkest surburbia in a desperate attempt to drag Chuffer Enright and Splotter Lippinscale back to juvenile mischief-making. The rare occasions when Summer Wine ventures into the world of the modern, middle-class housing estate always look downright weird… it’s like Compo, Clegg and Foggy have wandered into the wrong sitcom, and are a whisker away from being chased down a leafy driveway by Margot Leadbetter or Thelma Ferris. But it’s also telling, on this occasion, that all their old schoolfriends now live fully in this world – they have suits, and big cars, and wives with social pretensions. ‘There’s a tramp at the door…’ sniffs Chuffer Enright’s wife, crushingly underlining for us the fact Compo, Clegg and Foggy have resolutely failed to move on in their lives one iota. Andrew: I’m starting to feel a bit of that alienation at the moment; everyone I know seems to be settling into careers and buying property while I can barely figure out how to sort my tax code out for my one part time job. Suddenly, the world seems a lot more serious than I’m currently able to deal with! I could be wrong, but I think Splotter lives on the same estate, perhaps even the same street, that Blamire lived on in the pilot episode. I have a terrible memory and could be wrong, but this seems very familiar. Bob: Oh, well spotted! Actually I’m not sure if Tempus Fugit might have been a better title for this episode. It’s painfully obsessed with the passage of time, and the loss of childhood magic. Chuffer Enright, he claims, has no recollection of our heroes at all, and has succumbed to the miserable ravages of time. ‘I get these terrible colic spasms,’ he grumbles. ‘And then there’s me knee… you’ll not believe this knee…’ It’s a world away from Compo’s gleeful romanticizing of marbles, pudding-bowl haircuts and ‘sherbert round the mouths’. Splotter Lippinscale, it transpires, is similarly uninterested. It’s so sad, because… well, it’s so true. I find, as I get older, that there are two distinct camps of people when it comes to childhood reminiscences… those – like me – who revel in them, and whose obsessions with revisiting the tiniest details of their youth can sometimes even come at the expense of the present. And those who, like Chuffer and Splotter, seem to have put their childhood in a firmly-sealed box and kept it resolutely out of sight. They’ve moved on, and find no joy (or even exquisite melancholy) in looking back. When the two camps get together, the divisions can be painfully awkward. Andrew: This episode is making me feel guilty about backing out of traditional Christmas Eve pints last year in order to stay in and watch The Snowman and the Snowdog. With people continuing starting to drift apart, I should really seize the moments that remain! Then again, the previous year resulted in me getting ‘ill’ and having to… ahem… fertilize a local farm; perhaps my not turning up was for the best. Andrew: How on earth did we manage to pass over so many pubs when we were last down there? Bob: It’s noisy in the bar, but they’re too depressed to face the revelry, and slump sullenly in the lounge to nurse their stale drinks. It seems like a very downbeat and poignant ending for a Christmas episode… but then it turns. It’s possibly one of the most predictable twists in sitcom history, but… aw, sod it. It still brings a huge rosy glow to my heart. 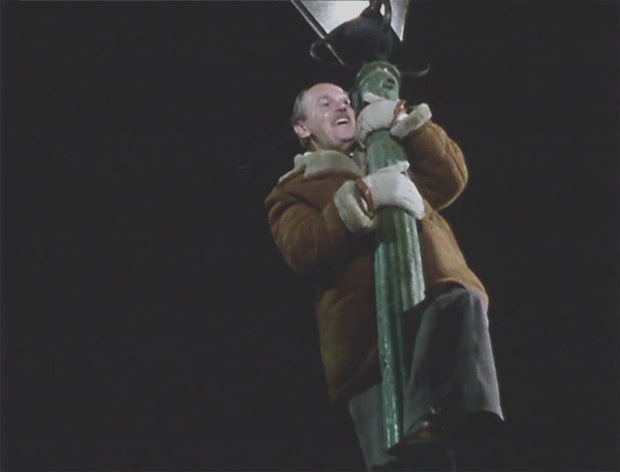 Sid and Wally and Chuffer and Splotter all turn up, and – by the end of the night – they’re shinning up lampposts outside the pub and then, in a lovely touch, jumping off the last bus home on Christmas Eve while it’s still moving. Andrew: I wouldn’t say it’s a predictable outcome at all! Given Clarke’s previous distaste for Christmas episodes, this burst of sentimentality took me completely by surprise. The innocuous ‘Merry Christmas, Chuffer ’ may be one of my favourite lines of the series thus far, but readers will have to watch the episode themselves to find out why! Bob: And, as a bonus, we see Nora and Ivy setting aside their recent differences and drinking sweet sherry together, at home, resplendent in their Christmas best. And I know it’s Kathy Staff and Jane Freeman, but all I can see is my Mum and my Gran and my Auntie Norma doing exactly the same thing on exactly the same Christmas Eve in 1981. With Val Doonican’s Very Special Christmas burbling away on TV in the background. It’s beautiful, and it put a huge soppy grin on my face. This isn’t just a cracking, heartfelt Christmas episode, it’s an episode that touchingly and thoughtfully puts us firmly back in touch with the show’s roots… of staving off mortality and melancholy by staying true to your inner child, and cherishing the things that really matter in life – friendship, fun and family. I loved this. I really, truly did… it’s a glorious piece of TV, and one of the best episodes we’ve seen so far. Andrew: Yep, it’s great start to the decade. With the foreknowledge that the series will change dramatically over the course of the next ten years, I can only hope that Clarke can hold on to this incredibly thoughtful, incredibly sweet, incredibly melancholic atmosphere for just a little while longer. I’ve been eagerly awaiting this entry because this is definitely my favourite LotSW episode. It should also be noted that this marks the debut of Alan Bell directing. You can also start to see more wide shots and more long shots showing off the scenery even more than before. Good observation, Jakob. We have some more specific stuff about Alan Bell’s direction coming up over the next few episodes. Gordon ‘Splotter’ Lippinscale’s house is on Westfield Avenue, Meltham. The left side now has an arched carport built onto it. Why would Compo imagine his friends wouldn’t buy him a present – or was he just angling for more? The overdose of nostalgia seems a bit aimless to me. Somehow the premise of meeting two old friends who’ve lost touch with their youth is a vague summation of the series, but doesn’t convince. It doesn’t help that Chuffer Enright appeared among the guests awaiting Gordon’s wedding in Series 3. At least Sid & Wally get to join in for once. It’s intriguing though if this the start of the Alan Bell Era, and the café set change has never occurred to me before. I’m not really won over by that title, mind. Watched this again last night. Chuffer’s wife was of course briefly in “Forked Lightning” and went on to divorce Chuffer and marry Seth in Emmerdale (Farm). Chuffer’s knee seems like a retread of Stuart’s knee in that S3 episode. John Rutland only died in 2013, at the grand age of 96! Saw him in a film recently made in 1963 and he already looked ancient. Brilliant episode, watched it last week on DVD. Paula Tilbrook could also be seen as the barmaid in “The man from Oswestry” and the connection with Seth from Emmerdale is in the episode “The flag and it’s snags”. 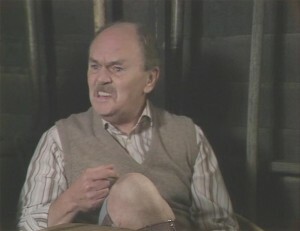 John Rutland was also in an episode or two of “One foot in the grave”.